Leah Hogsten | The Salt Lake Tribune Republican presidential candidate Texas Sen. Ted Cruz, R-Texas, speaks during a campaign rally for Sen. Mike Lee, R-Utah on the American Preparatory campus in Draper, Saturday, March 19, 2016. Carly Fiorina and Glenn Beck were also in attendance. Leah Hogsten | The Salt Lake Tribune Republican presidential candidate Texas Sen. Ted Cruz, R-Texas, speaks during a campaign rally for Sen. Mike Lee, R-Utah on the American Preparatory campus in Draper, Saturday, March 19, 2016. Carly Fiorina and Glenn Beck were also in attendance. Leah Hogsten | The Salt Lake Tribune Republican presidential candidate Texas Sen. Ted Cruz, R-Texas, speaks during a campaign rally for Sen. Mike Lee, R-Utah on the American Preparatory campus in Draper, Saturday, March 19, 2016. Carly Fiorina and Glenn Beck were also in attendance. Leah Hogsten | The Salt Lake Tribune Republican presidential candidate Texas Sen. Ted Cruz, R-Texas, speaks during a campaign rally for Sen. Mike Lee, R-Utah on the American Preparatory campus in Draper, Saturday, March 19, 2016. Carly Fiorina and Glenn Beck were also in attendance. 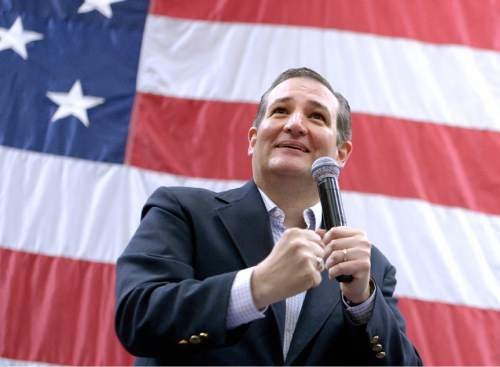 Texas Sen. Ted Cruz has zoomed to a commanding lead in Utah&apos;s GOP caucuses, according to a new poll released Saturday. It also gave a glimpse into how frustrated the state&apos;s Republicans are with Donald Trump&apos;s candidacy. The Y2 Analytics survey shows Cruz with 53 percent support among likely Republican caucus-goes and if that matches Tuesday&apos;s caucus vote, he&apos;d win all of the state&apos;s 40 GOP delegates. Coming in second is Ohio Gov. John Kasich with 29 percent, while Trump, the national front-runner, was a distant third at 11 percent. The Y2 Analytics poll was conducted from Thursday to Saturday and included 500 respondents, capturing some of the reaction from public events held by all three of the Republican candidates. 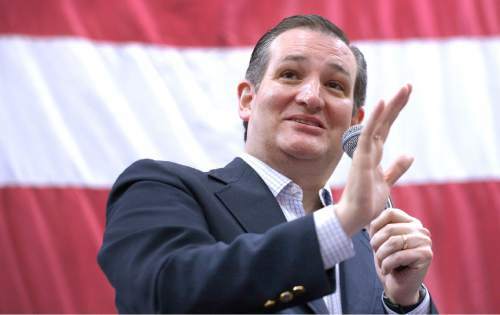 Cruz held three public events in Utah on Saturday with Sen. Mike Lee, R-Utah, commentator Glenn Beck and former presidential candidate Carly Fiorina. Kasich and Trump held events on Friday. Trump has the clearest path to the nomination, while Cruz, who is second in the delegate hunt, argues he is in the best position to block that. A complete victory in Utah would be a start, which is why he said Saturday that a vote for Kasich was in essence a vote for Trump. If Kasich or Trump are able to cut into Cruz&apos;s lead, dropping him below 50 percent of the vote, they&apos;d be able to snag some of the delegates, which would then be awarded proportionately. This is the first poll released in the state in over a month, and the only one since the field narrowed to just three candidates. 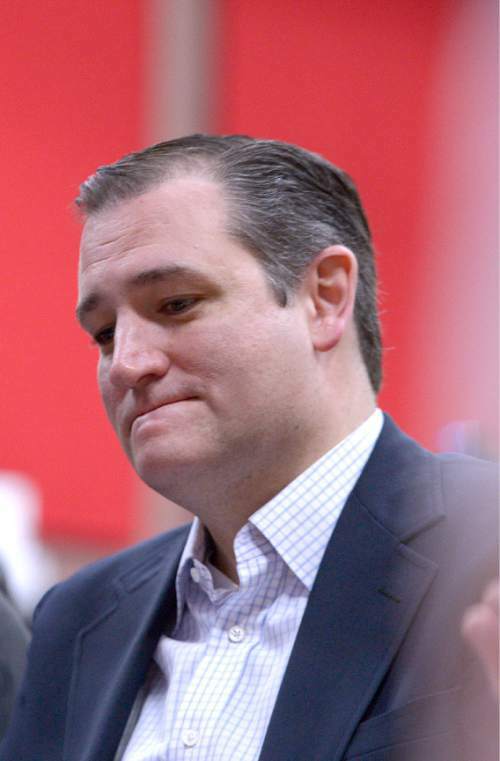 It showed that Cruz performed even better among "very likely" caucus attendees, coming in at 57 percent. Scott Riding with Y2 Analytics said it appears that a bulk of Florida Sen. Marco Rubio&apos;s supporters went to Cruz after he dropped out earlier this week. 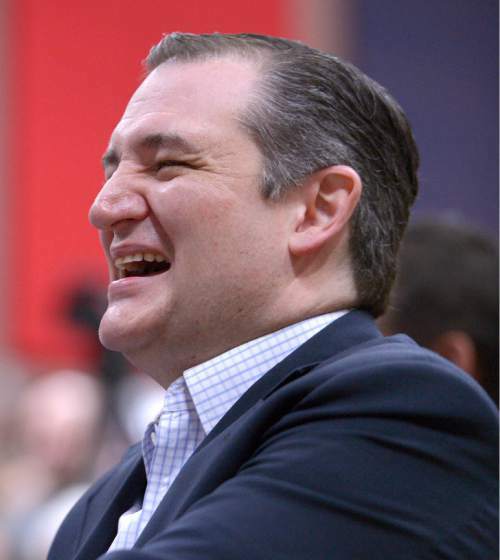 "It is fascinating to see how close Cruz is to wrapping it up," he said. "It is also surprising how discouraged Republicans are with the direction of the national party." The poll found that 81 percent of respondents said the Republican Party had gotten off on the wrong track and 64 percent said Trump would make the party weaker if he became the nominee. Only 29 percent of the respondents promised to vote for Trump in a general election, while 25 percent said they would write in another candidate, 15 percent said they&apos;d vote for a third-party candidate and 7 percent said they&apos;d back the Democrat. Don Peay, who is heading Trump&apos;s efforts in Utah, said he believes the billionaire businessman can make up ground in the final days. "I&apos;m just going to wait to see what the poll says on Tuesday," he said in reference to the official caucus vote. Kasich&apos;s chief strategist John Weaver said: "It is vital that Trump be locked out of delegates and it seems we are on track for that." He added that: "We have strong movement toward John Kasich and believe we will do well, especially given that neither Cruz or Trump offer a path to winning in November." There&apos;s been little polling in the Utah caucus. Before the Y2 Analytic poll, the last survey was conducted by Utah Policy in mid-February when there were still five candidates in the race. Riding from Y2 Analytics noted that polling caucuses "are particularly difficult," because it is hard to determine who will attend. He relied on historic caucus attendee information from the firm Data Elect. Y2 Analytics did not poll in Utah&apos;s Democratic caucus.